Kashani, E. (2013). The Effect of wastewater Sirjan golgohar industrial on the characteristics of cultivated soils in several species of pasture trees. International Journal of Advanced Biological and Biomedical Research, 1(3), 313-320. Ehsan Kashani. "The Effect of wastewater Sirjan golgohar industrial on the characteristics of cultivated soils in several species of pasture trees". 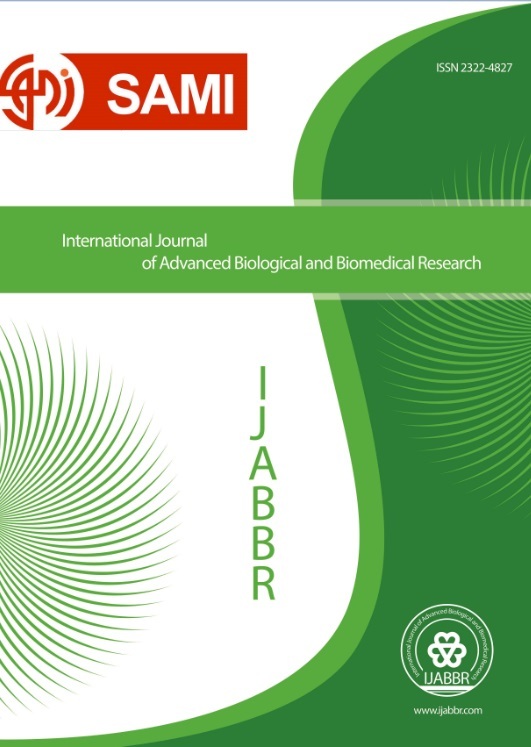 International Journal of Advanced Biological and Biomedical Research, 1, 3, 2013, 313-320. Kashani, E. (2013). 'The Effect of wastewater Sirjan golgohar industrial on the characteristics of cultivated soils in several species of pasture trees', International Journal of Advanced Biological and Biomedical Research, 1(3), pp. 313-320. Kashani, E. The Effect of wastewater Sirjan golgohar industrial on the characteristics of cultivated soils in several species of pasture trees. International Journal of Advanced Biological and Biomedical Research, 2013; 1(3): 313-320. Collection and reuse of wastewater and sewage in agriculture, natural resources and green environment is one way to conserve water resources and environmental. The aim of this study were to investigate the effects of wastewater Sirjan golgohar industrial on the characteristics of cultivated soils in several species of pasture trees. This study was performed at the Sirjan city which is located in southwest of kerman province (1766 meters above the sea level, 29º 27 N latitude and 55º 40 E longitude, and 162 mm annual rainfall). This experiment was conducted a completely randomized design block testing in split factorial with 5 treatment and 3 replicated. In this study, we used different ratios of water and wastewater including control (normal water), 25% wastewater + 75% water, 50% water + 50% wastewater, 75% wastewater + 25% water and wastewater of sirjan golgohar industrial. These treatment were used for irrigation of several species of pasture trees (Pestasia atlantica, Amygdalus scoparia, Amygdalus elaegnifolia and Acer monspessulanum). Data were analyzed by ANOVA using general linear model procedure of SPSS software. Significance between means was tested using Duncan Multiple Range Test. A probability value of P ≤ 0.05 indicated that the difference was statistically signiﬁcant. Results showed that the difference between mean treatments in the study was significant (P<0.05). Comparison of heavy metal concentrations in soil before and after treatment showed that the using of wastewater sirjan golgohar industrial were increased heavy metals in soils. Between treatments in terms of ECe, SAR and pH was observed difference significantly, the amount of ECe, SAR was highest and lowest in control and wastewater treatments respectively. With the increasing of waste, the amount of organic materials have also increased, the treatment with wastewater have the largest amount of organic matter. In generally, we can conclude that the using of wastewater treatments due to decrease salting and increase organic matter than to control treatments can improve the soil for the plants. Al-Mutaz, I.S., (1989). Treated Wastewater as a Growing Water Resource for Agriculture Use, Desalination, 73: 27-36. Marecos do Monte M. H. F., Angelakis A. N. and Asano T. (1996) Necessity and basis for the establishment of European guidelines on wastewater reclamation and reuse in the Mediterranean region. Water Sci. Technol. 33(10-11), 303-316. Asano T., Smith R.G. and Tchobanoglous G. (1985). Municipal wastewater: treatment system and reclaimed water characteristics. In Irrigation with Reclaimed Municipal Wastewater: A Guideline Manual, eds G. S. Pettygrove and T. Asano. Lewis Publishers, Chelsea, MI 48118. Feigin, A.; Ravina, I.; Shalhevet, J. (1991). Irrigation with treated sewage effluent: management for environmental protection. Berlin: Springer-Verlag, 224p. Bouwer, H.; Chaney, R.L. (1974). Land treatment of wastewater. Advances in Agronomy, v.26, p.133-176, 1974. Feigin, A.; Bielorai, H.; Dag, Y.; Kipnis, T., (1978). GISKIN, M. The nitrogen factor in the management of effluent-irrigated soils. Soil Science, v.125, p.248-254, 1978. QUIN, B.F.; FORSYTHE, L.J. (1978). Surface irrigation of pasture with treated sewage effluent. II. Drainage losses of nitrate and other nutrients. New Zealand Journal of Agricultural Research, v.21, p.427-434. HOOK, J.E. (1981). Movement of phosphorus and nitrogen in soil following application of municipal wastewater. In: NELSON, D.W.; ELRICK, D.E. ; TANJI, K.K. (Ed.) Chemical mobility and reactivity in soil systems. Madison: Soil Science Society of America, p.241-255. FONSECA, A.F. (2005). Viabilidade agronômico-ambiental da disposição de efluente de esgoto tratado em um sistema solo-pastagem. Piracicaba, 2005. 174p. Tese (Doutorado) - Escola Superior de Agricultura Luiz de Queiroz, Universidade de São Paulo. Hamer, G., T. Egli and N. Al-Awadhi, (1989). Polluted Water Renovation for Reuse: Recent Biotechnological Advances Applicable in Hot Arid Regions, Desalination, 72:31-65. Smith, Robert G. and M. R. Walker, (1991). Water Reclamation and Reuse, Research Journal of the Water Pollution Control Federation, 63(4): 428-430.